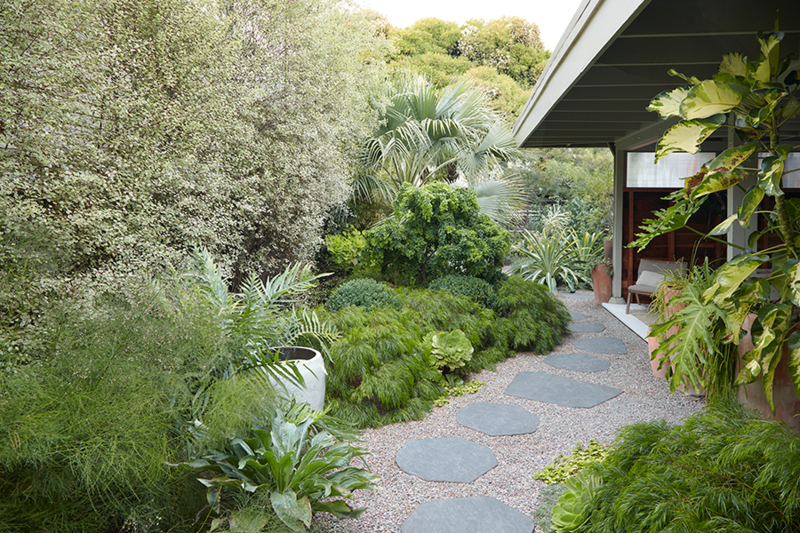 San Francisco nurseryman Flora Grubb has converted gardeners, designers, and urban planners in California and worldwide to her cause of making lavishly beautiful landscapes that require minimal water and chemicals to maintain. Her artful Bayview district nursery, Flora Grubb Gardens, has become a gathering place for design-driven gardeners who are committed to the wiser use of resources. Flora came of age as a gardener in Austin, Texas, during a drought. 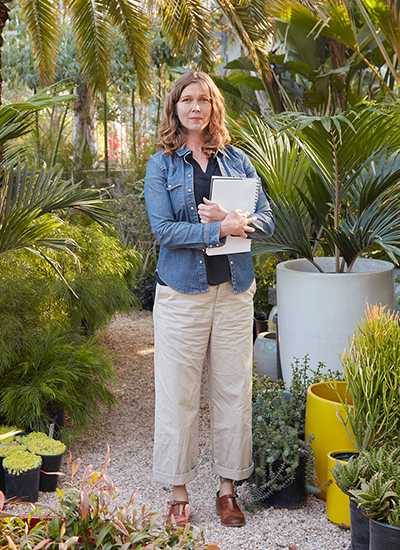 Dazzled by the flora of the Bay Area, she moved to San Francisco in 1999, started a landscaping business, and later opened the neighborhood nursery that would grow into Flora Grubb Gardens. 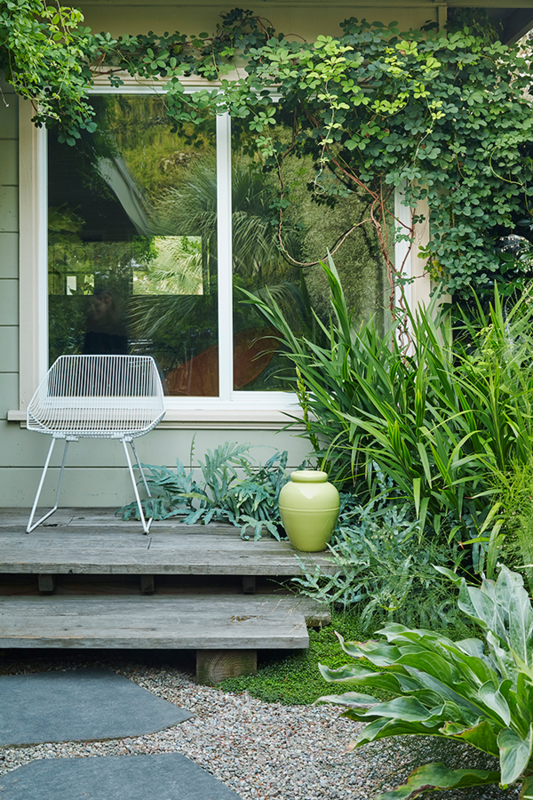 Gardens are her passion, and the daily practice of tending her own garden at home in Berkeley is her happiest pastime. It’s been almost six years since Flora and her son, Greyson, moved in and started planting, and while their original vision for this peaceful, low-water sanctuary remains intact, the architecture of the garden has changed as the plants have established themselves and matured. Flora’s home is a perfect example of how watching a garden’s evolution over time can be one of life’s deepest joys. 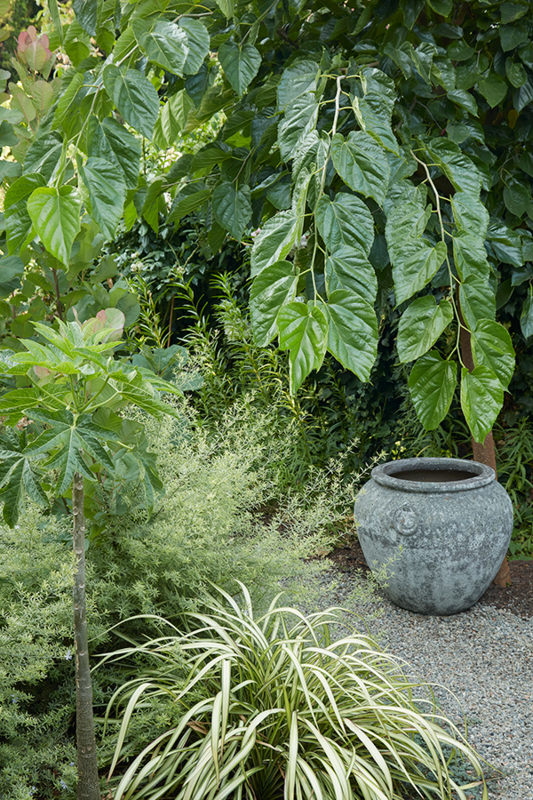 So much of the fun of gardening is in observing and adapting to a garden’s changing personality. If you’re willing to embrace the wildness and unpredictability of nature, then the challenges that arise as your plants mature can feel like beautiful surprises. Flora spends at least fifteen minutes each day pruning and maintaining her garden, observing how the plants assert their natural hold on the space and constantly adjusting her own vision in turn. One of her earliest design choices was to create a gently curved path leading from her front gate to the door, with careful plantings that would complement the undulating shape. Over the years, billowy Acacia cognata ‘Cousin Itt’ began to overtake the beds along the path—but Flora loves the movement and texture that the dominant acacia brings, so she decided to let it do its thing, relocating some its smaller neighbors to the backyard. To Flora’s surprise, her gorgeous, silvery Brahea clara, a favorite fast-growing palm, has established itself so happily and become so full that it’s now almost an architectural feature, serving as a kind of natural wall that divides the entry garden just behind the street fence from the more private living space beyond. 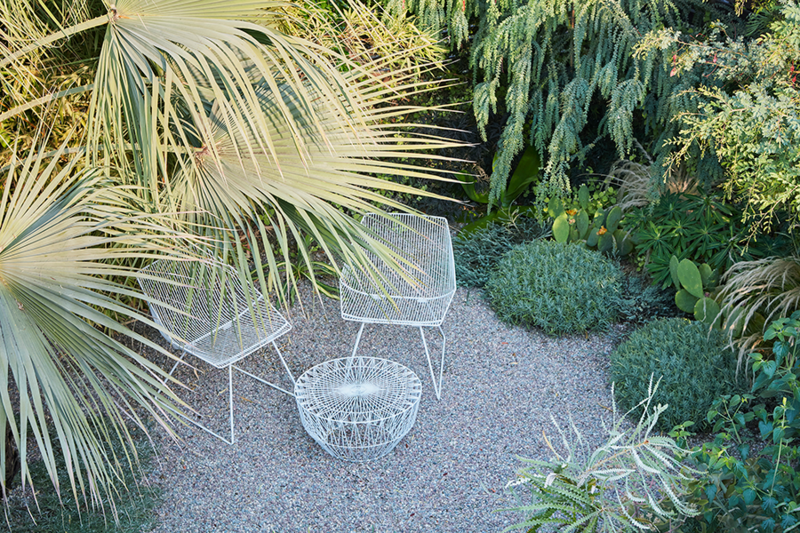 A garden’s furnished spaces tend to evolve over time, too, as you learn how best to enjoy the light and shade in different seasons. 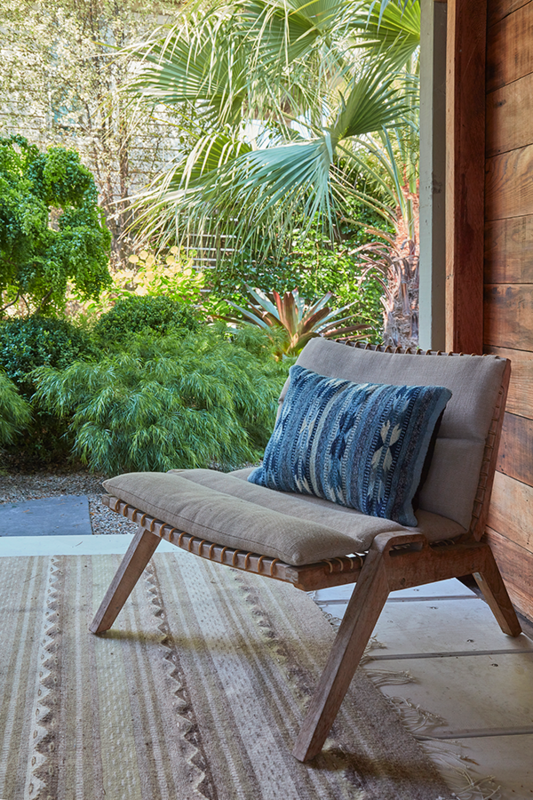 Flora’s gardens—both the manicured front yard and the wilder, more free-form backyard—are designed to allow her and Greyson to follow the sun throughout the day, with sitting and lounging areas sprinkled everywhere. Flora loves covered spaces because you can use them spontaneously, without having to sweep or mess around with the furniture much. Blankets, pillows, and rugs make these spaces feel like additional rooms of the house, to be used just as comfortably and as often as the indoor rooms. What better way to enjoy the cool Bay Area evenings than a hot outdoor bath? Plantings around Flora’s backyard soaking tub have grown in beautifully over the years, creating more privacy and a peaceful lushness. 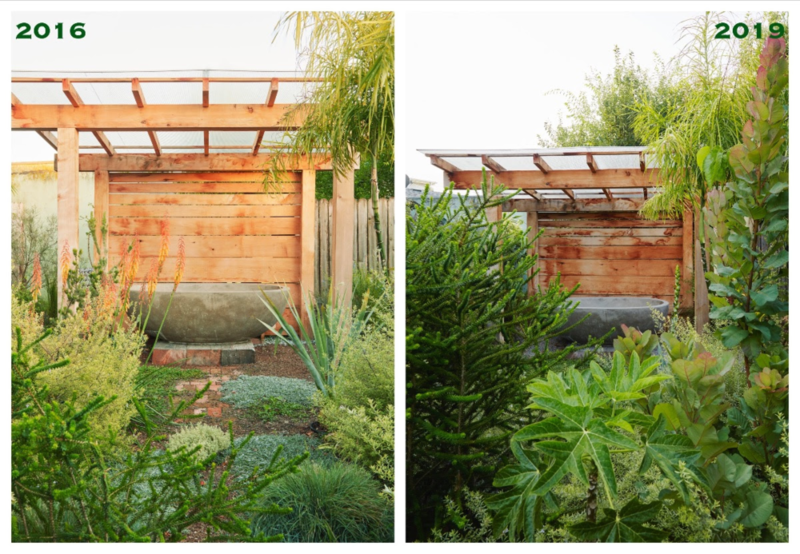 Graywater from the bath feeds the surrounding beds of drought-tolerant plants. 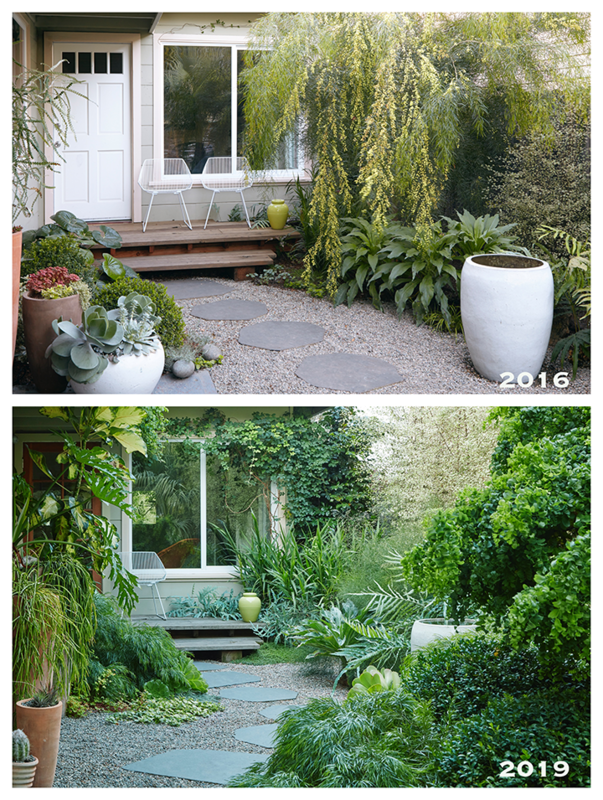 For most new gardens, three years is about how long it takes for the plants to mature enough for the design to begin to hang together. These photos show Flora’s garden now, while the 2016 photos below show the garden as a baby, just a couple of years after it was planted. Scroll down to see how much has changed! And yet, with Flora’s flexible and curious approach, the garden has retained its essential character as a calming and richly textured hideaway. 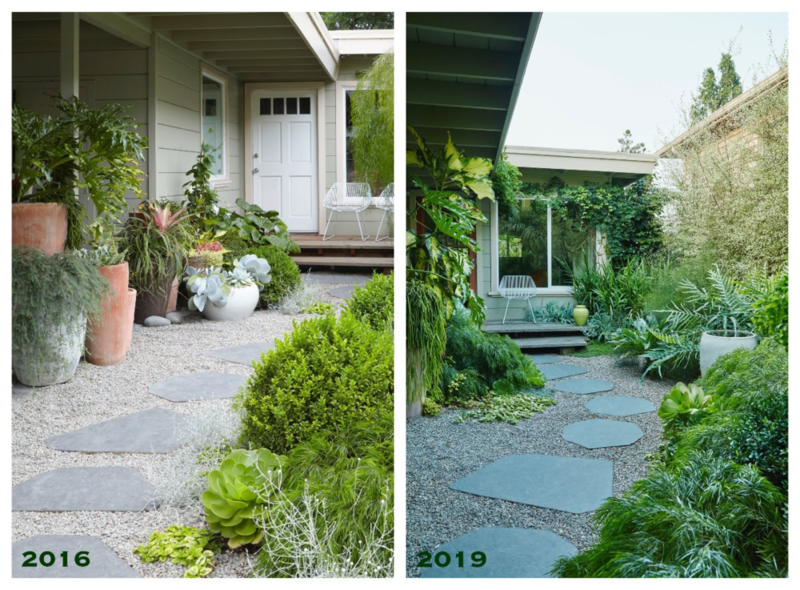 For more inspiration and some helpful tips, you can read about the different stages of Flora’s garden in Martha Stewart Living, from 2016, and in last year’s Sunset Magazine cover story.